Automation of vehicles aims to make transportation of people and goods more efficient, but also much safer. According to the DOT and National Highway Traffic Safety Administration (NHTSA), 37,133 deaths were from motor vehicle crashes in 2017, with 94% of those involving driver-related factors, such as impaired driving, distraction, and speeding or illegal maneuvers. AV 3.0 is still technically a draft document, with the next step in the process being its publication in the Federal Register, allowing public comments and review. AV 3.0 will not be a law that needs to be followed, but rather guidance framework for automated vehicles that can be followed so that once they are more prominent, all industries are already prepared. The document goes into detail on principles, levels, roles, and the future of automation. The U.S. 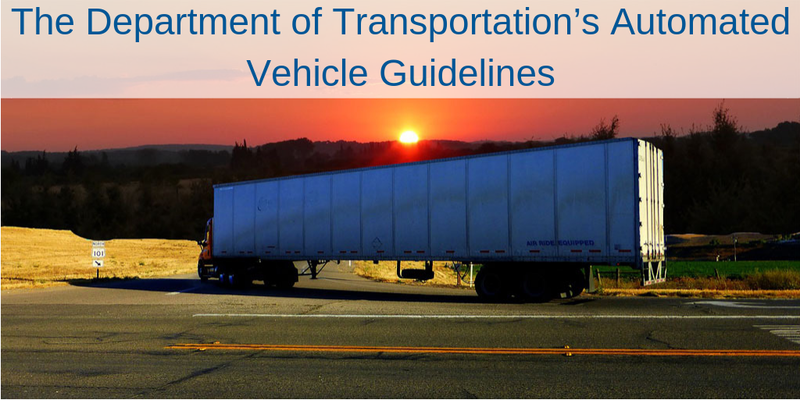 DOT will base their policy-making on the following six principles, establishing a clear and consistent Federal approach. Although automation has the potential to increase safety on the roads by eliminating human error, safety concerns also come with the new technology. The DOT will employ testing and other methods to address the potential safety risks and ensure that the public can have confidence in the new technologies. We will remain technology neutral. The DOT states that they will “adopt flexible, technology-neutral policies that promote competition and innovation as a means to achieve safety, mobility, and economic goals.” This stance allows the public to choose their own technology solutions rather than the Federal Government. A major change that the DOT will be making to their regulations is the definition of a “driver” or “operator.” These will not pertain solely to a human anymore, but also an automated system. Outdated regulations will be modernized or eliminated completely in order to fit with the changing times. We will encourage a consistent regulatory and operational environment. We will prepare proactively for automation. 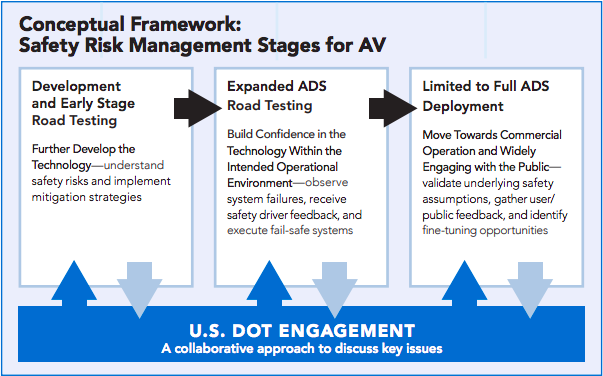 Rather than waiting for automated technology to be at the level of universal implementation, the DOT plans on proactively sharing best practices and guidance (such as AV 3.0) to help the transition go smoothly. We will protect and enhance the freedoms enjoyed by Americans. The DOT will not take away people’s freedom to operate their own vehicles. Their vision is automated vehicles operating alongside manually-driven vehicles. There are various levels of automation for vehicles, and having each level clearly defined is crucial for creating laws and regulations for the new technologies. 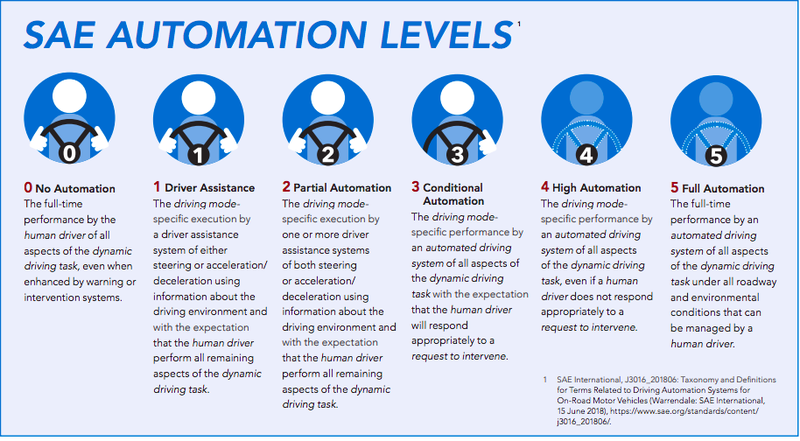 SAE International mapped out 6 levels of vehicle automation that the DOT is using as a basis for their automated vehicle guidance. Federal, State, and Local governments -- along with the private sector -- will all play a role in helping to deploy automated vehicles. The Federal Government is responsible for “regulating the safety performance of vehicles and vehicle equipment.” This ensures that the technology being released is safe for the public. So what does this mean for the trucking industry? For now, there are no major changes coming. Once automated vehicles become more prevalent, there could be a threat to drivers, but the DOT also believes that additional jobs will be created because of the technology. Want to learn more about industry regulations, problems, future trends, and the tools and strategies to help you stay ahead of the curve? Download the Agile Fleet Playbook and discover everything today’s fleet leaders need to know. Contact us if you have any questions or want to see what Vertrax technology can do for you!